Christmas is my absolute favorite holiday, one that I begin anxiously anticipating in July. Celebrating the birth of the Savior, visiting family and friends, exchanging gifts, decorating, and eating: I love ALL of it! Every Christmas is unique, but the one I celebrated six years ago will forever be one of the most memorable. Six years ago, Sean and I celebrated our first Christmas as husband and wife. We lived in a nice but tiny apartment at the time, and didnât have much room for decorating. 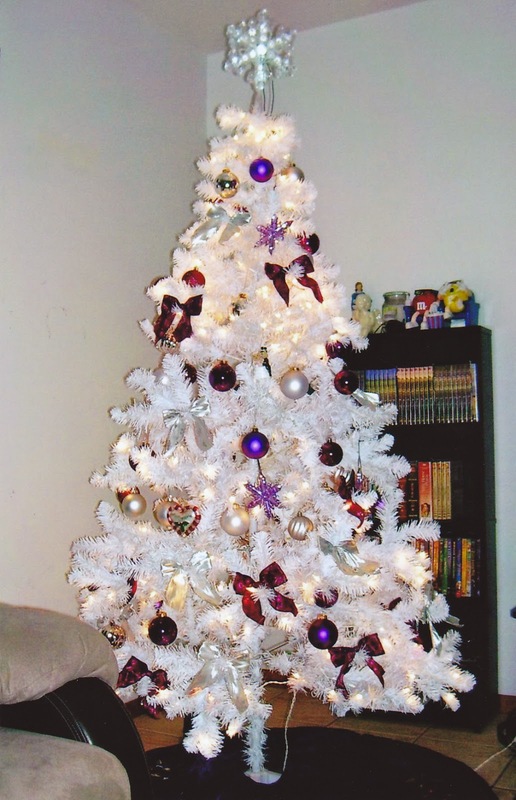 We excitedly purchased our first tree, a six-foot, artificial white one that we decorated with various purple and silver ornaments since that was our weddingâs color scheme. We bought two special ornaments as well: a ceramic red and green striped heart with Our First Christmas emblazoned on it and a teddy bear bride and groom with a cake that bore the same inscription. We expected to keep those ornaments for a lifetime. 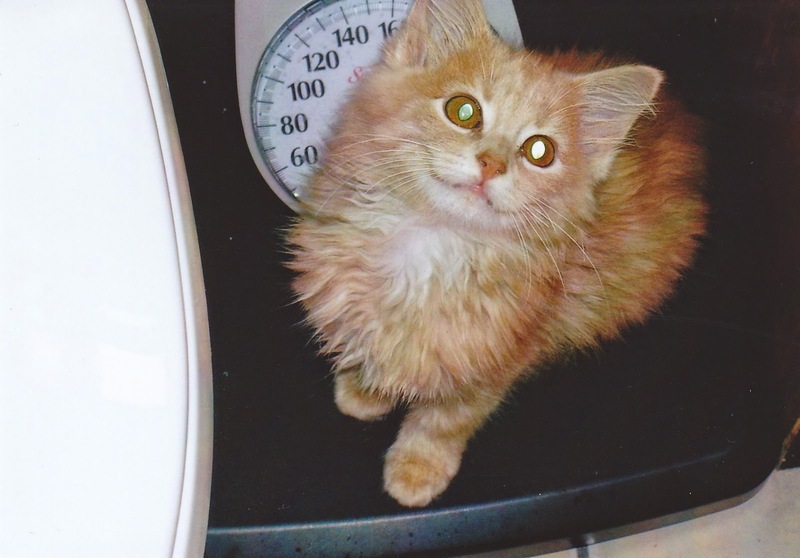 But we forgot to figure Rusty in the equation. named him Rusty. 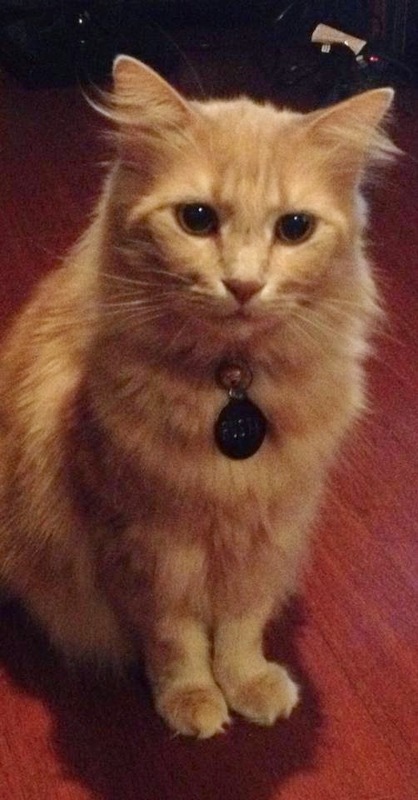 We knew Rusty was unique from the moment the pet store sales clerk placed him in our arms. With a white M on his forehead and teeth that throwback to the saber-toothed tiger (two of his top teeth literally extend from his mouth), this was no ordinary kitty. And his behavior was anything but ordinary. He curled in my lap one minute and viciously attacked my hand the next. When he wasnât purring sweetly or attacking one of us (usually me), he played fetch. We gave him a small, stuffed smiley face toy that was supposed to be a car visor clip. Embroidered on the smiley faceâs body were the words Jesus Loves Me. When we threw this toy, Rusty fetched it and dropped it in our laps. He could play fetch for hours. That is, until we put up the tree. Then, he discovered a new game. This one was called How Far Can I Climb Up the Tree and How Many Ornaments Can I Destroy? The answer? All the way to the top and too many ornaments to count, including the special ones. We managed to keep the tree in one piece until after the holiday by using wire fasteners to hold the branches in place. As for the ornaments, several (including the red and green heart) shattered in tiny pieces. 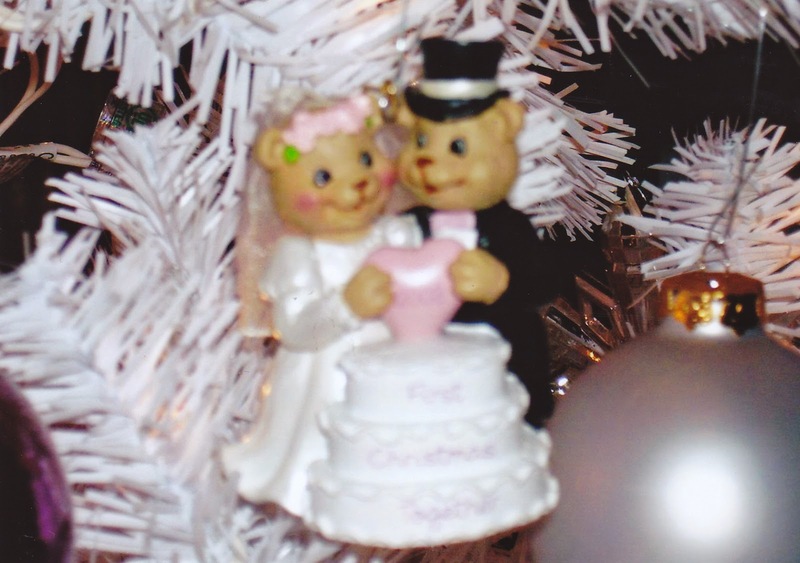 The fall from the tree decapitated the teddy bear bride and groom, but thankfully, Superglue saved them. of the apartment. When he shattered the heart ornament, I threw his toy and screamed, âItâs a good thing Jesus loves you because no one else does!â Ten seconds later, I cuddled him, apologizing for the outburst. Six years later, Sean and I no longer live in the apartment. We are the proud owners of a small yet comfortable, hexagon shaped house. We decorate a tree every Christmas, but we havenât chosen another white one. We donât really have a color scheme for the tree, but our special ornament collection has increased. And we still have the teddy bear bride and groom with their heads intact. Six years later, we have three cats and a dog, and one of those cats is Rusty. He still has the M on his forehead and the saber-teeth, but he doesnât fetch anymore. And, he shows no interest in the Christmas tree. Every year we decorate the tree the weekend after Thanksgiving, and every year we wait for Rusty to repeat his first Christmas. So far, nothing. He lies on the tree skirt, but thatâs it. So, when I think about the Christmases Iâve celebrated and which ones are most memorable, I definitely remember six years ago. 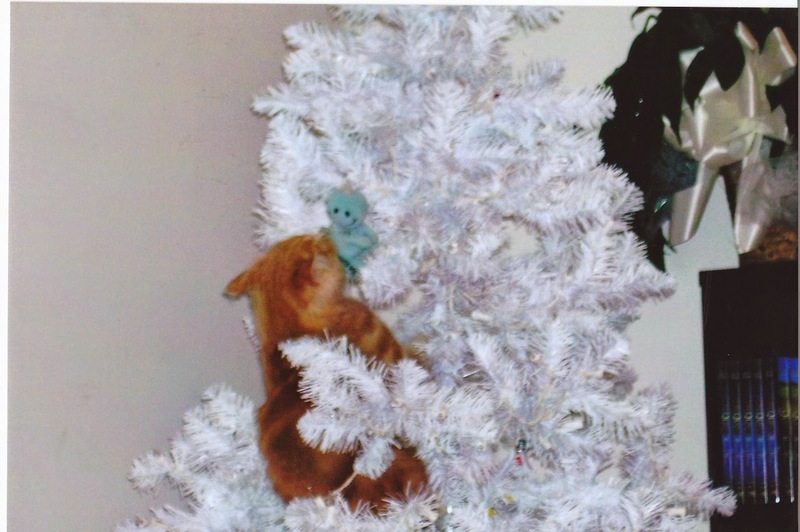 The Christmas of love, a cat, and the wrecked Christmas tree. How about you? Which Christmas is your most memorable and why? Please feel free to comment! That is such a sweet memory, Latricia!  It is the smaller, heartfelt things in life that mean the most!